A near total consensus has been reached amongst scientists: climate change threatens life on Earth, and it is caused by human actions. Essentially, the release of greenhouse gases (GHG) into the atmosphere traps heat, thus warming the planet. The implications of this are myriad and devastating. Sea levels will rise, swallowing most major cities across the globe — creating mass population displacement. Extreme weather events will become more frequent, taking lives, and requiring expensive relief and rebuilding. While the coasts will suffer from stronger storms, the interior areas of the globe will likely endure incessant droughts, threatening water supply and agriculture. Widespread starvation and thirst will ensue. Obviously, the climate crisis can no longer be ignored. But, how will humans avert this planetary catastrophe and their own extinction? Scholars, scientists and policymakers have debated this question for decades. A fascinating proposition to address this crisis has emerged out of neoliberal thought: green capitalism. Green capitalism is the idea that the market is the best means to combat climate change. Some “green” market solutions include cap-and-trade, carbon taxes, green consumption, and the development of clean technologies by benevolent billionaires in the private sector — just to name a few. Free market liberals assert that these schemes can perpetuate the capitalist system while preserving the environment. Yet, I contend that capitalism, even when regulated and manipulated by market schemes, is wholly incompatible with planetary health. I argue that socialism is the only form of political economy that can maintain democracy and ecological stability simultaneously. Historically, industrial capitalism is causally linked with earth-warming carbon emissions (fig. 1). 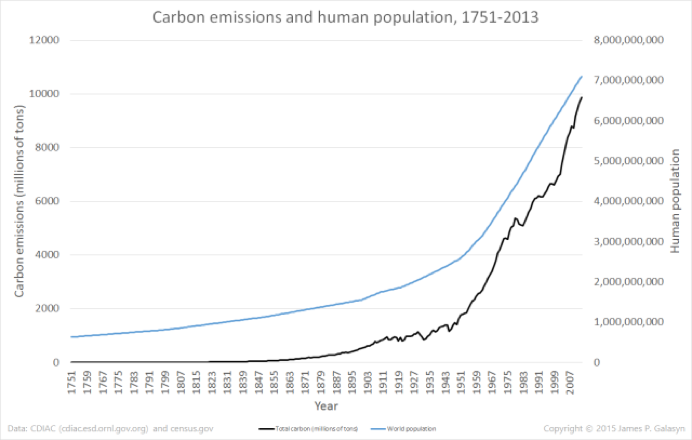 As the capitalist system has expanded, emissions have risen. This is not a controversial point: the more fundamental disagreement is if capitalism is predisposed to environmental destruction, or if this linkage can be decoupled. Ecosocialists disagree: declaring capitalism the principal driver of ecological collapse. An integral reason Ecosocialists maintain this argument is capitalism’s requisite for infinite economic growth. Capitalism, by definition, seeks profit. For capitalists to accumulate more profits, they must keep capital circulating. They can do so by reducing reinvestment into labor and the environment. The incessant need for capitalism to circulate capital and expand has been described as “an accelerating treadmill” that must consume increased labor and resources to survive. Yet, the resources of Earth are finite; humans cannot exploit and expand indefinitely. Eventually, growth must cease. In the book What Every Environmentalists Needs to Know About Capitalism, the authors explain, “No-growth capitalism is an oxymoron: when accumulation ceases, the system is in a state of crisis.” Previously, any time growth has stagnated devastating economic implications followed — as observed with nations like the Soviet Union, Japan, and the United States during the Great Depression. The conception that capitalism can exist without growth is historically contradictory. Green capitalists counter this critique, arguing that capitalism could exist without growth theoretically — functioning as a steady state economy. The most popular theory supporting a steady state economy is the Solow Growth model (fig. 2). There are a litany of unrealistic assumptions the model makes: no government, no international trade, no technological change, and an unchanging labor force. Yet, the most problematic assumption the model makes is that capitalist firms can be satisfied and operate with the same profit returns each year. The zero-growth idea is wholly incongruent with the nature of capitalism. Firms accumulate capital so they can invest and create more capital. The Solow Growth model reflects an exchange process in which a commodity C is traded for money M to purchase another commodity, expressed as C-M-C. In this equation, M is simply a means to acquire a commodity. But, I argue that this is a fallacious representation of the economy. A more accurate formula is, as outlined by Marx and Keynes, is M-C-M, in which money is invested to produce a commodity to yield more money. A similar “flaw” manifests in the housing market. In the United States alone, there over half a million homeless people (fig. 3), while there are an estimated 5.8 million vacant homes. Numerically, there are enough homes to shelter every citizen; but this does not happen because it is not profitable. Rather than invest in sorely needed affordable housing, developers build lucrative luxury real estate. Housing markets have financialized, functioning as a tool for the wealthy elite to grow their capital. Luxury condos and apartments in American cities are purchased not for living, but for speculative profiteering. All the while, low and middle-income needs are neglected, resulting in an affordable housing and homeless crisis. The drug and housing markets demonstrate that capitalist firms produce in order to accumulate more money, rather than providing a commodity: representing M-C-M, not the neoclassical C-M-C assumption. Thus, the crux of the Solow Growth model is unrealistic. Capitalism necessitates growth for another reason — debt. The capitalist economy, “Is in debt, dependent on future growth, owed by future producers and consumers; the current income of capitalists and workers is drawn on a generational IOU; the entire system must keep growing or it will collapse.” Banks and bond holders lend because they anticipate the loan will be fulfilled with interest, thus rendering a profit. For the borrowing firm to fulfill its obligation, it must expand. For example, when a start-up company secures a loan, they use the funds to produce goods and services that otherwise did not exist; to repay the loan, the start-up must begin production. As capitalism financializes, debt-induced growth becomes more relevant. The entire stock market is driven by the promise of future profitability: one purchases stock with the singular motive of receiving a higher return at a later date. For a firm to fulfill such expectations, it must expand production. Green capitalists may argue that profits can be produced by other means, like technological innovation. Improved and more efficient technology can lower costs without growth, thus producing profits in a steady state. As technology evolves, automation requires less human labor to complete equivalent work; providing greater profits. But, there are clearly limitations to this logic: if production increases efficiency to its fullest potential, workers will be obsolete. If workers are no longer employed, they have no wages to purchase commodities. Thus, the entire system crumbles. Even the baron Henry Ford reasoned that paying his workers more would offer greater long-term rewards, “No one loses anything by raising wages as soon as he is able. It has always paid us. Low wages are the most costly any employer can pay.” Yet, technological progress and mechanization will render the majority of workers obsolete, and to the eventual economic collapse. Additionally, the decoupling of growth and emissions faces another hurdle, known as Jevons Paradox. The paradox maintains that as energy efficiency increases, effectively making energy cheaper, consumption will increase. This can negate “More than 100% of the [energy] savings achieved by the original innovation.” The absolute decoupling of emissions from economic growth proves to be impossible. Society cannot simply replace fossil fuels with renewable energies and continue business as usual. Despite technological advancements, most evidence indicates that renewable energy cannot support the American level of consumption. The ecological footprint that is considered sustainable is 1.67 global hectares per person — the average American’s ecological footprint is about five times amount, meaning it would require 5 earths if all people lived like the United States population. This is a baffling level of consumption, continuing this path is impossible and unsustainable. Further, as nations of the Global South develop their economies, their ecological footprints will grow, putting greater pressure on the planet. It would be unfair and immoral to force the Global South to cease development in order to preserve the United States’ extraordinary consumption and growth. Renewable technology and efficiency cannot continue at such a dramatic and continuous rate eternally. There are practical limits in technologic advancement, as illustrated in the transportation sector. The United States’ is extremely dependent on oil, as 41 percent of end energy use is transportation, while only 5 percent of transportation is powered by non-oil sources. Electrifying the vehicle fleet is a proposed solution to decarbonize transportation; electric vehicles can be powered by renewable energy. This solution is appropriate when applied to light individual cars, but is unsuited for heavy road vehicles, ships and aircraft. Liquid fuels cannot simply be substituted by electrification, as larger forms of transport would require batteries too large to be practical. There are some alternatives to electrification, but none are sufficient to satisfy current and expanding transportation needs. For instance, sails and kites can greatly reduce fuel use on ships, but with notable limits. Sail and kite power would significantly reduce ship speed, while requiring boats to have to wait for the right currents, tides and winds. Biofuels could be swapped for gasoline in heavy vehicles and airplanes, but again, there are restraints. Considerable amounts of energy must be used to produce biofuels; in the United States growing, harvesting, transporting and distilling ethanol is extremely energy intensive. It requires about 70 percent more energy to produce ethanol than the energy ethanol contains. Further, an immense amount of land is needed to grow enough biofuels for air travel. To meet present-day aviation needs, 1.11 million square kilometers of land must be dedicated to raising biofuel crops, or about 2.5% of current agricultural land. This is unattainable, and would only become more difficult as the aviation industry grows. The environmental impacts, costs and scalability of biofuels imposes serious limitations on future mobility. Thus, if transportation cannot be maintained or expanded in a renewable future, what happens? Stated plainly, society will be less mobile. Industries reliant on transportation and machinery will be circumscribed; global trade will decrease, tourism will slow, and industrial agriculture output will lessen. GDPs of nations across the globe will stall, as these sectors drive economic growth. Such obstacles are not intended to eschew the renewable transition — that transition is indisputably necessary. In highlighting the limitations of the renewable world, I illustrate the inability to completely decouple energy use and economic growth. Clearly, present consumption in the United States cannot be preserved in a renewable economy. If America’s (and generally the Global North’s) consumption is already extraordinary, then expansion is obviously impractical. As described, capitalism requires infinite growth and exploitation of resources. Because this is unsustainable, I argue that the future must be socialist. The current political economy must be overhauled and replaced with a system that prioritizes the planet over profit. Critics highlight the history of previous socialist projects, asserting that socialism was attempted before and failed. For instance, the Soviet Union and Mao-era China are notorious for its environmental destruction. The USSR experienced heavy pollution, declining freshwater supplies, while China deforested large swaths of pine forests. Not to mention, there were egregious human rights violations and acts of violence committed by the authoritarian governments. The difference between these regimes and a future socialist society is clear: socialism. Socialism, in its true form, has never existed — including self-proclaimed socialist states such as the USSR and China. These nations are considered state capitalist, in which the state seizes the means of production and replaces the capitalist. Effectively, little changes, and the state makes a profit off of workers instead of private businesspeople. This prompts the question: what is realsocialism, and why is it an integral component of combatting the climate crisis? Essentially, socialism is a political system where the economy is democratized. This means that that workers, rather than capitalist, own the means of production. This is otherwise understood as worker cooperatives: in which workers vote for their leaders within a company, rather than the current (and certainly undemocratic) system where the Board of Trustees decides all business decisions void of worker input. Most of the time, a CEO’s interests are diametrically opposed to that of the common worker. This is because the capitalist seeks the highest profit possible; as little else matters in the capitalist system, like labor and the environment. In the socialist workplace, the profit motive is removed — a firm must only remain solvent. Wealth is distributed more equitably among all workers, as opposed to mass profiteering by CEOs and other high-ranking executives in the capitalist system. Currently in the United States, CEO pay is 361 times greater than the average worker. This egregious wealth inequality leads to a lack of empathy and moral decision-making. Several studies indicate that wealth leads to decreased compassion and empathy. Thus, a privileged elite like a corporate Board of Trustees is less likely to make empathetic and morally just decisions than a worker cooperative where wealth is distributed. Consider these findings when evaluating corporate environmental decision making: like the case of Volkswagen’s emission fraud scandal, the Deepwater Horizon oil spill, and Love Canal. How could such a nefarious fraud and environmental destruction continue on a fairly regular basis? I argue that the extreme wealth accumulation of the capitalist system encourages immoral and callous decision making. A cooperative, socialist workplace that operates equitably and democratically must be replace capitalist firms to avoid further ecological disaster. As observed, the highest profit is extracted by investing as little as possible into labor and resources. Thus, the capitalist system is built upon imposing environmental externalities onto society like pollution and greenhouse gas emissions. Even if a firm decided to invest enough money to replenish the environment properly (such as cleaning up pollution, replanting deforested trees, and replacing fossil power with renewable sources) labor must be exploited to maintain profit. This is what I call “green barbarism,” a society that preserves the environment, but maintains extreme inequality — for example, a company produces solar panels with sweatshop labor. 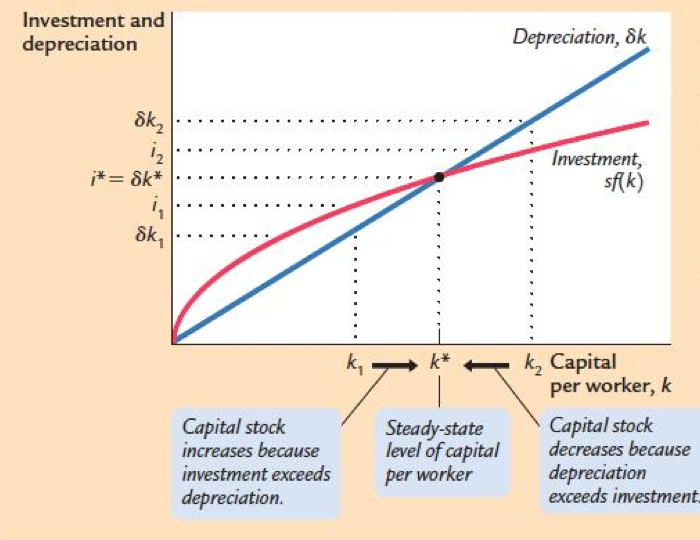 Socialists argue that capital should be removed from this equation to adequately compensate labor and resources. Although many environmentalists recognize that the capitalist system is incompatible with the preservation of Earth, they claim it is quixotic to advocate for socialism. More moderate, mainstream environmentalists are sympathetic, yet ultimately critical of the Ecosocialist vision. In his review of This Changes Everything, environmental scholar Daniel Fiorino remarks, “A global anticapitalist revolution does not appear to be in the offing,” justifying a more incremental approach to climate action. Yet — I question such centrist rationale. Throughout history, the privileged and professional classes have failed to foresee political change. One of the latest examples is the election of President Donald Trump. For most pundits, pollsters, and political professionals — Trump’s victory came as a complete surprise. The vast majority of polls predicted a victory for Hillary Clinton; at some points in the campaign, pollsters asserted that there was a single-digit likelihood that Trump would win the presidency. In the mainstream political and media realms, there was a consensus that Trump would lose the election, including President Obama, George Clooney and the Simpsons TV show. Previously, few could imagine a modern president that brags about sexual assault, vilifies the press as “the enemy of the people,” and heaps lavish praise on dictators. President Trump incessantly contradicts the norms established by the ruling elite, yet they continue to be surprised by his supporters’ loyalty and the dearth of political backlash. Similarly, many denounced Bernie Sanders’ presidential bid in 2016 because he identifies as a socialist. Sanders’ rise and legitimate challenge to Secretary Clinton’s pursuit of the democratic nomination surprised elites. These recent cases demonstrate that political “truths” held by scholars and elites are often out of touch with the working-class zeitgeist. Those within the political and academic establishment may hold that a complete overhaul of the political system is out of the question Yet, history indicates otherwise. Previously, extreme wealth inequality has only been lessened by catastrophes like plagues, wars, and revolutions. Deepening inequality cannot expand endlessly, and it appears that the United States is nearing the limits of inequity. Inequality is often measured by the Gini coefficient: scoring total egalitarian societies as 0 and completely unequal ones as 1. Currently, the United States scores at a jarring .81. There is no precedent for resolving such ingrained inequalities without a dramatic event like revolution. In these hyper inequitable times, a socialist revolution and upheaval of capitalism is not far-fetched. In fact, it may be a more probable outcome than limitless continuation of current economic barbarism. As Marx predicted in his crisis theory, it is inevitable that global capitalism will eventually collapse. There are two possible causes of collapse. One is the ecological annihilation to fuel the incessant growth requisite of capitalism: meaning the end of a livable planet and the human race that exists in it. The second option for collapse, which I advocate for, is a voluntarist revolution to force the end of capitalism. Without a doubt, Ecosocialists have significant work ahead to realize a revolution. Policies and actions pursued should combat climate change, while also politicizing, radicalizing, and building working-class power. For example, advocating for free and expanded public transportation achieves both of these goals. Improved public transportation would slash greenhouse gases, while simultaneously improving quality of life for those at the bottom who cannot afford cars. Similarly, low-carbon affordable public housing achieves the same goals. Both of these initiatives could be part of a “Green New Deal,” like the plan proposed by Congresswoman-elect and Democratic Socialist Alexandria Ocasio-Cortez. A Green New Deal would radically restructure the U.S. economy away from carbon, create jobs, and expand the welfare state. These policies seem unimaginable and unattainable in the neoliberal era. Thus, many market liberals argue that environmentalists must compromise their ultimate goals, instead favoring incremental approaches to curb warming, like cap-and-trade and venture capitalism. But this approach is precarious. Such market approaches only entrench the present economic system — allowing capitalism to perpetuate itself by expanding into spaces like carbon markets. For instance, the European Union Emissions Trading System (EU ETS) was created in 2005 to comply with Kyoto Protocol standards. Since the program’s implementation, though, there has been little change in emissions. In 2006, the price of carbon plummeted, allowing for polluters to make windfall profits. This initiative did the opposite of its original intention: awarded polluters. Even if the price of carbon was increased by governments, companies that stockpiled cheap credits after the market bust can continue business as usual. It would take many more years before these polluters feel the tightening of cap-and-trade, and begin developing cleaner technologies. But, we have no time to waste. I argue that market schemes like cap-and-trade do not provide the radical shift away from fossil fuels required to avert a global crisis. In fact, carbon markets give large polluters an easy out to perpetuate the status quo, rather than forcing them to invest in carbon-free technology. Emitters can purchase cheap offset credits from others, often in the Global South, rather than create a green infrastructure in the heavy-polluting Global North. For example, China’s newly built hydroelectric plants sell their extra carbon credits on the international market; essentially providing the Global North with a stable, inexpensive way to continue polluting. These hydroelectric plants were planned before the installment of ETS, therefore, no environmental gains are made, and massive amounts of money is wasted. Furthermore, although hydroelectric energy is not carbon-intensive, it still has devastating effects on local environments, like deforesting massive swaths of land to then flood. Green New Deal (rather than market-based) policies prompts citizens to question the neoliberal austerity they have become accustomed to, and expect the state to provide more. These actions illuminate a brighter vision for the future, sowing the seeds for uprising. Violence is not requisite for this revolution; mass, nonviolent strikes could be more effective than armed conflict. A critical mass of workers withholding their labor can bring the entire capitalist system to a grinding halt. If workers in the food production system went on strike, grocery stores would be barren. Airline workers could stop all air travel. Teachers could cease education: as they recently did in West Virginia, consequently having their demands fulfilled (Bidgood, 2018). There are myriad possibilities. In conclusion, Ecosocialists argue that capitalism is simply unsustainable. This economic paradigm produced the climate crisis by exploiting Earth for profit; as it burns fossil fuels that warm the planet, fails to absorb destructive externalities, fights environmental regulations, and encourages overconsumption and limitless growth. Capitalism must be abandoned in favor of a system that prioritizes society and the Earth over profit. Ecosocialism means expanding democracy into the economy, rather than enlarging the state or turning to eco-authoritarianism. A beautiful and thriving planet without war, famine, and oppression is achievable. Although critics may claim this vision is quixotic, I argue that the only barrier to reaching an egalitarian, ecological democracy is political imagination. Environmental justice advocate Ashish Kothari urges for society to “dare to dream another future” by imagining a utopian vision for the future, returning to the present, and then creating a plan to get there. Environmentalists must create a climate action plan that clears a path for political-economic revolution. Another world is not only possible, but now necessary. BBC. (2017, 6 Dec). 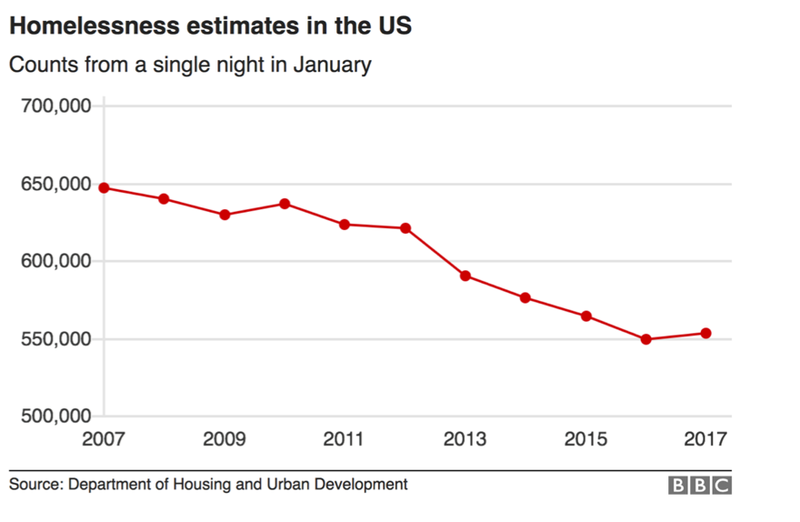 US homeless people numbers rise for first time in seven years. BBC. Retrieved from https://www.bbc.com/news/world-us-canada-42248999. Bellamy Foster, J. & Magdoff, F. (2011). What Every Environmentalist Needs to Know About Capitalism. New York, NY: Monthly Review Press. Blackwater, B. (2012). Why do capitalist economies need to grow? Greenhouse Think Tank. Retrieved from https://www.greenhousethinktank.org/uploads/4/8/3/2/48324387/why_capitalist_economies_need_to_grow_-_for_green_house_-_10_10_14.pdf. Cillizza, C. & Blake, A. Donald Trump’s chances of winning are approaching zero. (2016, Oct 21). The Washington Post. Retrieved from https://www.washingtonpost.com/news/the-fix/wp/2016/10/24/donald-trumps-chances-of-winning-are-approaching-zero/?noredirect=on&utm_term=.f36e7f687664. DiLorenzo, T. (1992, Mar 1). Why Socialism Causes Pollution. Foundation for Economic Education. Retrieved from https://fee.org/articles/why-socialism-causes-pollution/. Everybody’s Favorite Law. (2017). Jacobin Magazine, 26,43–44. Fitzroy, F. & Papyrakis, E. (2010). An Introduction to Climate Change Economics and Policy.London, England: Earthscan. Florida, R. (2018, Jul 27). Vacancy: America’s Other Housing Crisis. CityLab. Retrieved from https://www.citylab.com/equity/2018/07/vacancy-americas-other-housing-crisis/565901/. Florida, R. & Schneider, B. (2018, Apr 11). The Global Housing Crisis. CityLab. Retrieved from https://www.citylab.com/equity/2018/04/the-global-housing-crisis/557639/. Gregoire, C. (2014, Jan 6). How Money Changes The Way We Think And Behave. Huff Post. Retrieved from:https://www.huffpost.com/entry/psychology-of-wealth_n_4531905. Gstalter, M. Trump tweets video montage of people saying he couldn’t win the presidency. (2018, Jul 8). The Hill. Retrieved from https://thehill.com/homenews/administration/396038-trump-tweets-video-montage-of-people-saying-he-couldnt-win-the. Helm, D. (2012). The Carbon Crunch. London: Yale University Press. Hembree, D. (2018, May 22). CEO Pay Skyrockets To 361 Times That Of The Average Worker. Forbes. Retrieved from https://www.forbes.com/sites/dianahembree/2018/05/22/ceo-pay-skyrockets-to-361-times-that-of-the-average-worker/#2c4f6b53776d. Henry Ford Quotations. Retrieved from https://www.thehenryford.org/collections-and-research/digital-resources/popular-topics/henry-ford-quotes/. Hinks, S.K. (2012, July/Aug). What is the tendency of the rate of profit to fall? Socialist Review, 371. Retrieved from http://socialistreview.org.uk/371/what-tendency-rate-profit-fall. Hotten, R. (2015, Dec 10). Volkswagen: The scandal explained. BBC. Retrieved from https://www.bbc.com/news/business-34324772. Klein, N. (2014). This Changes Everything.New York, NY: Simon & Schuster. Pannekoek, A. (1936). State Capitalism and Dictatorship. International Council Correspondence, 3:1. Retrieved from https://www.marxists.org/archive/pannekoe/1936/dictatorship.htm. Pearson, C. S. (2011). Economics and the Challenge of Global Warming. Cambridge: Cambridge University Press. Robbins, J. & Moore, S. (2010). Environment and Society. West Sussex, England: Wiley-Blackwell. Rull, J. The Solow Growth Model [PowerPoint slides]. Retrieved from https://www.sas.upenn.edu/~vr0j/econ10205/lectures/grow5_solow.pdf. Scheidel, W. The Only Thing, Historically, That’s Curbed Inequality: Catastrophe. (2017, Feb 21). The Atlantic. Retrieved from https://www.theatlantic.com/business/archive/2017/02/scheidel-great-leveler-inequality-violence/517164/. Schumacher College. (2018, Jan 21). Ashish Kothari says we need to dare to dream a different future. Retrieved from https://www.youtube.com/watch?v=1vfk3juRofU. Solon, O. (2013, 14 Mar). Bill Gates: capitalism means male baldness research gets more funding than malaria. Wired. Retrieved from https://www.wired.co.uk/article/bill-gates-capitalism. United Nations Environment Programme [UNEP]. (2011) Decoupling Natural Resource Use andEnvironmental Impacts from Economic Growth. Retrieved from http://www.ourenergypolicy.org/wp-content/uploads/2014/07/decoupling.pdf. Wright, C. & Nyberg, D. (2015, Sept 20). ‘Green capitalism’ is a myth. Business Insider. Retrieved from https://www.businessinsider.com/green-capitalism-is-a-myth-2015-9.